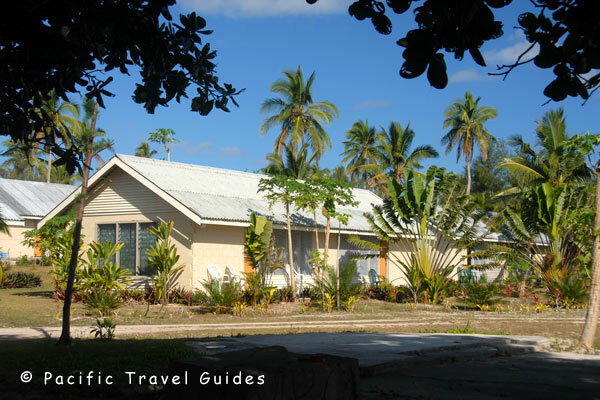 White Sands Beach Resort is a delightful small retreat on the west side of Tongatapu offering outstanding value for money. Run by a New Zealand couple, White Sands has just three bungalows, each split into two spacious rooms set back 20 metres from a lovely secluded beach with protected swimming and some excellent snorkelling. There’s a swimming pool, meals can be supplied on prior arrangement or guests can also take a taxi ten minutes down the road to a handful of small beach restaurants. The six rooms are in rather ordinary single story cement bungalows but interiors are clean, well appointed and spacious making for comfortable living. The Queen bed is draped in colourful bedspread, there’s a lounge area (no TV) and a dining area for snacks with a fridge, kettle, toaster and some cutlery.